Taking this effort one step further, this year’s report underscores potential causes as well as solutions to global risks. 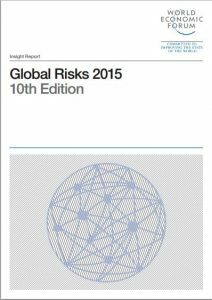 Not only do we set out a view on 28 global risks in the report’s traditional categories (economic, environmental, societal, geopolitical and technological) but also we consider the drivers of those risks in the form of 13 trends. In addition, we have selected initiatives for addressing significant challenges, which we hope will inspire collaboration among business, government and civil society communities. If the big issues of our times are instability, inequality and non-sustainability, then the narrative of human progress is facing increasing peril. Nowhere is this truer than in “fragile” contexts and countries trapped at the intersection of extreme poverty, conflict and weak governance. And while fragile countries are a minority, we cannot truly celebrate global progress until we see notable changes in these strongholds of fragility. We stand today at a historical inflection point: one that requires not only courageous leadership, but bold coordinated action to channel the power of markets and the private sector, in combination with the reach, wherewithal and influence of governments, multilateral organizations and civil society. There are no panaceas, fast fixes or shiny solutions to solve fragility and build resilience. However, Mercy Corps’ experience in the world’s toughest places provides some insight into opportunities for collective impact.